To download our Free quilt pattern NPQ for a Nine Patch Quilt, you will need the latest version of Adobe Reader to open and read this PDF file. You can get Adobe Reader by clicking here. Our Free Quilt Pattern NPQ | Nine Patch Quilt was designed using EQ7 software and is an easy quilt pattern to try no matter if you are a beginner quilter or an experienced quilter. You will find all the necessary instructions & templates that are unique for this nine patch quilt block, to complete a full size quilt plus a picture of the quilt. This is truly a gift that keeps on giving! You'll also get access to more easy quilts, like Lone Star 8-point Markup, 2 Rail Roller Frame, Civil War Quilt Patterns, Baby Duck Pattern and much, much more! Receiving any of the free easy quilts or mini-books is easy! Just sign up for our newsletter, "Quilting Tidbits," by supplying your first name only and email address. Once you have confirmed your subscription to our newsletter, you will receive instructions on how to download your easy quilts or free mini-book(s). We are proud of our newsletter and we think you will enjoy it too. It takes less than two or three minutes to scan the headlines. Then if you find something that is of interest it is convenient to spot read. But we are certain that you will read every word...it is that good. We are also proud of a growing collection of additional Easy Quilt Patterns that we create using the EQ7 software. If you have a special pattern that you would like us to create for a nominal fee contact us with the name of the pattern. 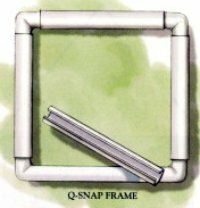 All of our patterns come with the necessary instructions, templates, fabric requirements and a picture to complete any of the projects. 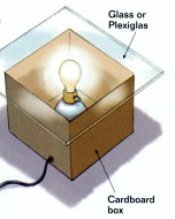 They are available at a nominal cost. 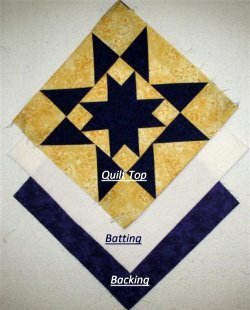 Please come back and share your success story whether it is making this free quilt pattern npq | Nine Patch Quilt or using any of the other beginner quilting designs or mini books. You can even post your picture in the gallery for others to rant and rave about. Whenever I work hard on a quilt I always like to share it and you will too! 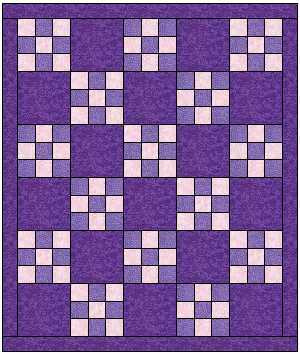 This easy quilt design is a single block repeated over and over until you achieve the size you want. This is the best way to learn too! 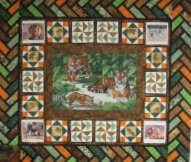 Some just make a wall hanging, others use it for a small child and others use it to create a full quilt. Please come back often and share your comments after you have viewed any of our mini-books. Let us know how we can improve and what it is that you are looking for in the pattern world. We forgot to mention that if you are already a subscriber, all you have to do to receive our freebies is use your password that was sent to you via your confirmation. We're often asked if there is a fee charged to receive the many patterns we publish on our site. We have made a conscious decision to keep this site full of information, tips on quilting, patterns, mini books and much more to all users in order to help others create those precious memories by the gift of giving a quilt. If you would care to, We do accept donations instead of charging a fee. This is purely optional, but by clicking on the donation button below and sending a donation of any amount lets us know that you find the information on this site valuable and want this site to continue to operate.